1. 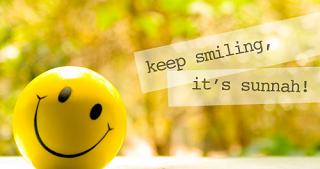 Smiling makes people feel good and positive, conveying a sense of good-will, rapport and trust. 2. Because of your smile, you make life more beautiful. 3. Do not let yesterdays disappointments overshadow on tomorrows dreams, because your life is like a mirror, if you keep smiling it smiles right back to you. 4. A smile is an inexpensive way to change your looks. 6. Always keep your head up - especially when you&apos;re down - so you can amaze everyone by how strong you are even if you&apos;re truly falling apart inside. 7. If you’re not using your smile, you’re like a man with a million dollars in the bank and no checkbook. 8. There is no weapon in the feminine armory to which men are so vulnerable as they are to a smile. 9. Life is never going to be as you planned. You need to make it happen yourself. 10. Wrinkles should merely indicate where smiles have been. 11. You’ll find that life is still worthwhile, if you just smile. 12. A smile is a curve that sets everything straight.